Use command-line tools to run the Metal compiler toolchain. Use the metal tool to compile each .metal file into a single .air file, which stores an intermediate representation of Metal Shading Language source code. 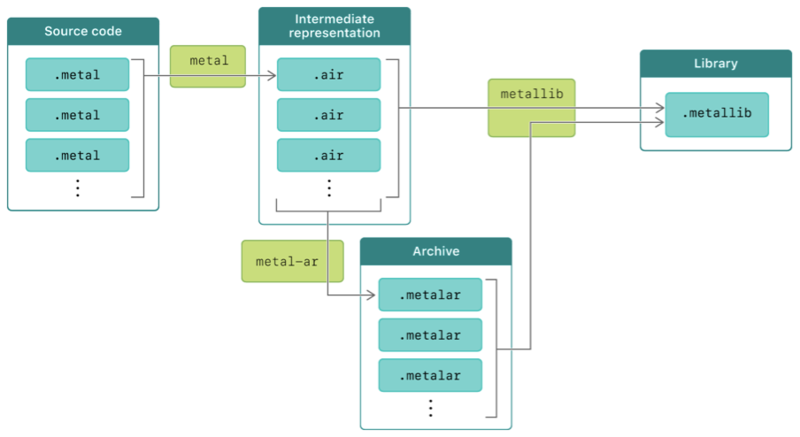 Use the metallib tool to build .air or .metalar files into a single .metallib file, which stores the Metal library. The following code shows the minimum number of commands that you need to compile and build a single .metal file into a single .metallib file. You can run these commands in the Terminal app and use the -help command to display the available options for each Metal tool. This example uses the macosx SDK, but you can use the iphoneos or appletvos SDK instead. After you've built a library with Metal's command-line tools, add the resulting .metallib file to your Xcode project. Then, at runtime, call the makeLibrary(filepath:) method to retrieve and access your library as a MTLLibrary object. Use the .metal filename extension to gain access to Metal's build, profile, and debug tools.